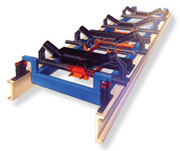 Thayer Scale’s conveyor belt weighing systems are designed for a range of accuracies: high accuracy loading and unloading systems, custody transfer and NTEP-approved versions (0.10% – 0.125%), inventory control and processing needs (0.25% – 0.5%), and various stone and aggregate applications (0.5% to 1%). Customers in fertilizer, forest products, mining, ore, recycling, biomass, cement, copper, and coal industries utilize our conveyor scales in various applications and in some of the most challenging manufacturing environments. Some industries use our single-idler quarry style style for harsh, high-density basic applications. Others such as the food and plant based industries use our belt scales for light-loading or low-density applications. These examples illustrate how our standard designs can support a wide range of belt scale applications with only minor modifications. We offer many special configurations and scale prices designed for just about every industry. We build 1, 2, 3, 4, 6 and 8 idler belt scales supporting belts from 14 to over 96 inches wide.